This is the story of the monumental struggle between New York and the natural world. From Henry Hudson’s discovery of Mannahatta to Hurricane Sandy, Gotham Unbound is Ted Steinberg’s sweeping ecological history of one of the most man-made spots on earth. Here is a tale of "the world with us"—lots of us—a groundbreaking book that recounts the four-century history of how hundreds of square miles of open marshlands became home to six percent of the nation’s population. Steinberg vividly brings a vanished New York back to life. You will see the metropolitan area anew, not just as a dense urban goliath but as an estuary once home to miles of oyster reefs, wolves, whales, and blueberry bog thickets. That world gave way to an onslaught managed by thousands, from Governor John Montgomerie, who turned water into land, and John Randel, who imposed a grid on Manhattan, to Robert Moses, Charles Urstadt, Donald Trump, and Michael Bloomberg. This book is a powerful account of the relentless development that New Yorkers wrought as they plunged headfirst into the floodplain and transformed untold amounts of salt marsh and shellfish beds into a land jam-packed with people, asphalt and steel, and the reeds and gulls that thrive among them. 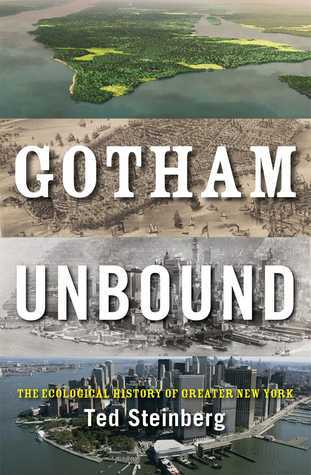 With metropolitan areas across the globe on a collision course with rising seas, Gotham Unbound is a penetrating history that helps explain how one of the most important cities in the world wound up in such a perilous situation.